Henna is a natural coloring agent obtained from the dried, powdered leaf of a small tree or shrub native to India, Egypt and Syria. 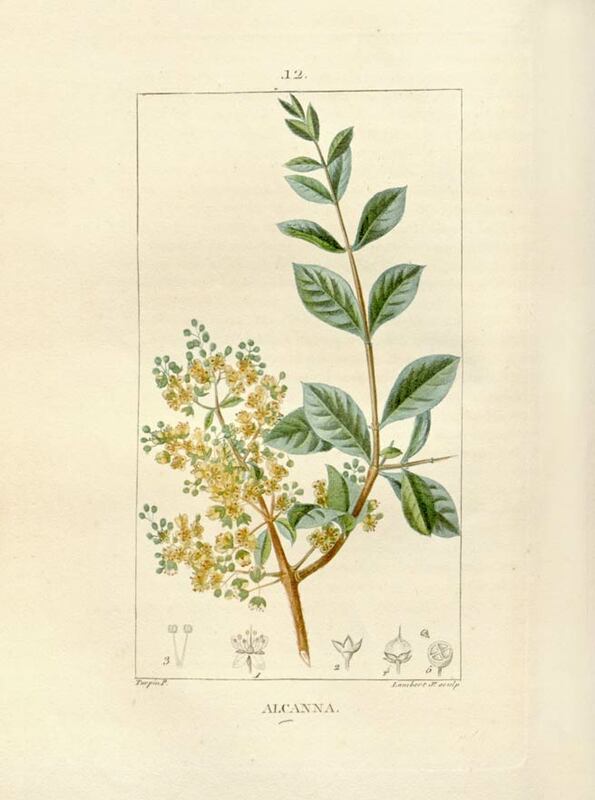 Also known as Egyptian privet and mehndi, henna was widely employed by the ancient Egyptians, who not only used the leaf to produce a dye for hair, skin and nails but also the flowers and fruit to make infusions and salves. Since the late 19th century, henna has been popular in Europe and North America is a natural way to “shampoo in” warm reddish-brown color and highlights into the hair. Mixed with other dried herbs, shades that vary from blonde to chestnut brown and black are possible. Henna is a tall shrub or small tree of the Lyrthraceae family, standing 1.8 to 7.6 m (5 ft 10 in to 24 ft 10 in) tall. It is glabrous and multi-branched, with spine-tipped branchlets. The leaves grow opposite each other on the stem and are glabrous, sub-sessile, elliptical, and lanceolate (long and wider in the middle; average dimensions are 1.5–5.0 cm x 0.5–2 cm or 0.6–2 in x 0.2–0.8 in), acuminate (tapering to a long point), and have depressed veins on the dorsal surface. Henna flowers have four sepals and a 2 mm (0.079 in) calyx tube, with 3 mm (0.12 in) spread lobes. Its petals are obvate, with white or red stamens found in pairs on the rim of the calyx tube. The ovary is four-celled, 5 mm (0.20 in) long, and erect. Henna fruits are small, brownish capsules, 4–8 mm (0.16–0.31 in) in diameter, with 32–49 seeds per fruit, and open irregularly into four splits. The English name "henna" comes from the Arabic word pronounced as hinna. The henna plant is native to northern Africa, western and southern Asia, and northern Australasia. Henna grows in sunny semi-arid zones and tropical areas. It does not thrive where minimum temperatures are below 11 °C. Temperatures below 5 °C will kill the henna plant. Henna grows well in a sandy, well-draining soil similar to a cactus mix. Sow henna seeds in March-April, cover lightly with compost and be patient: germination can be slow, sometimes several months. The process may be speeded up by sealing the pot inside a plastic bag and putting it in a warm place, such as a greenhouse. Once germinated, pot seedlings up on into individual pots and keep in a sunny location. Water well during the growing season and repot annually every spring. Flowering will not take place until the plants are at least 5 or 6 years old. Surplus leaves can be clipped from the plant as soon as it is large enough, and these can be dried and ground into powder. Store powdered henna in an airtight container in a cool, dry place. 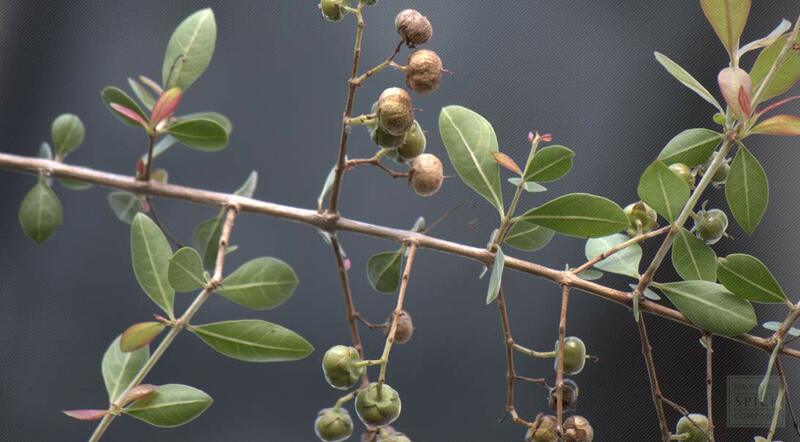 Henna (Lawsonia inermis) is a flowering shrub that belongs to the Lythraceae family, which includes myrtles, loosestrifes and the relative newcomer, pomegranate. For centuries, the plant has been used to produce a dye to color hair, skin, leather, wool and other textiles. Henna body art, characterized by highly intricate markings called Mehndi, has been an important part of eastern Mediterranean cultures since the Bronze Age. The practice of decorating the face and body is an expression of joy and used to invoke blessings of good luck and fortune. As such, henna is used to mark special occasions, including weddings, birthdays, saints’ days and other celebrations. When applied to hair, henna yields a deep, rich reddish-brown stain that coats the hair shaft, the effects of which may last for days or up to several weeks.